Bernie Sanders, who looks more like a disheveled grandfather than a revolutionary, has started a movement few predicted but probably should have seen coming a mile away. As the 2016 race for the White House gets rolling, the junior senator from Vermont and candidate for the Democratic Party’s nomination for president has surprised everyone by attracting huge crowds with a populist message of saving the middle class from a system that no longer works for everyday Americans — only a chosen few who control the levers of money and power. Sanders is at his best when talking about making the American economy fair again. He has put out a 12-point plan, or “Agenda for America 12 Steps Forward” as his campaign calls it, and most of the points aren’t anything new. They’re tried-and-true liberal-progressive ideas like equality for women’s pay, growing unions, taking on Wall Street and making college more affordable. The Sanders campaign has attracted more than 100,000 people to rallies both in well-known liberal strongholds like Portland and Seattle and in conservative cities like Phoenix and Dallas. And perhaps most incredibly, the Sanders campaign is getting this attention without pricey ad campaigns. Social media and word of mouth alone have been enough to attract a huge audience, the largest of which was a crowd 15,000 strong in Seattle. Compare those crowds with Clinton’s largest rally, which only had 5,500 attendees, and it’s easy to see which candidate is inspiring the most enthusiasm among voters. 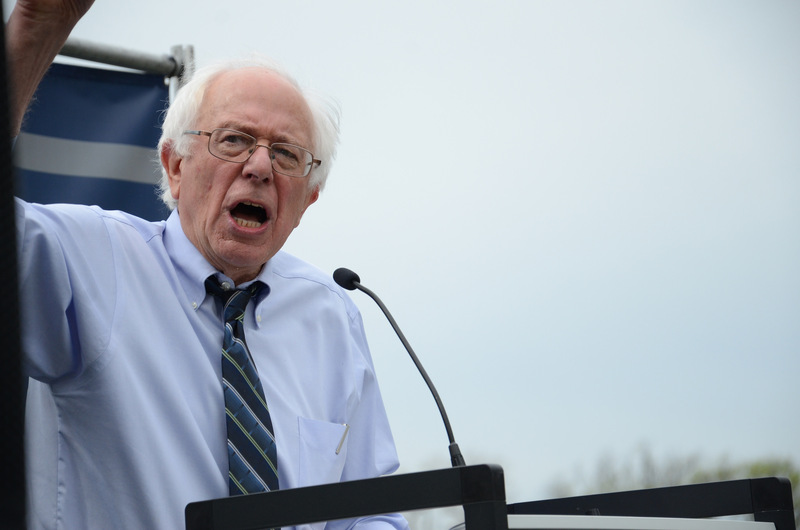 Sanders has been a vocal advocate for raising the minimum wage, and in late July, he introduced legislation to raise the national minimum wage to $15. In 2012, Sanders was elected by the state of Vermont to his second term in the Senate with a whopping 71 percent of the vote. Added to his 16 years in the House of Representatives, Sanders’ time in the Senate makes him the longest-serving Independent in American history. Sanders identifies his political affiliation as a Democratic Socialist; though he was elected as an Independent, he caucuses — meaning he works with and generally votes in line with — Senate Democrats. As chairman of the Senate Committee on Veterans Affairs, Sanders has been a champion for our veterans. Following revelations of a broken VA scheduling system, keeping our vets from accessing care they need in a timely manner, Sanders helped negotiate $15 billion to help veterans access care outside the system if they can’t get an appointment and to hire new VA doctors and nurses. Two of Sanders’ most recent rallies have been shut down by protesters from the #BlackLivesMatter movement who are unsatisfied with the candidate’s stance on criminal justice issues and police brutality. There’s nothing in his 12-point plan to fix a system that continues to murder and incarcerate entire generations of black Americans, and as Sanders is the most progressive candidate, BLM activists want a clear proposal from him to stop the violence. For all of Sanders’ progressive street cred, he’s going to need to do a lot more to speak to Democrats of color if he’s going to make any real dent in Clinton’s lead in the polls. Only 25 percent of Democrats who aren’t white view Sanders favorably, while Hillary gets 80 percent, according to a July Gallup poll. Bernie typically responds to protests with his admittedly impressive history of standing up with 1960s civil rights leaders, including Dr. Martin Luther King Jr. But that does little for today’s black communities which, as we see more attention being paid in mainstream media, are essentially living in a police state. Black communities rightfully want to know what took the rest of us so long to figure it out. Sanders, especially as a 73-year-old white guy from Vermont, absolutely has to articulate that he gets what’s going on in America for black people and that he’s going to do something to fix it in order to win over Democrat voters of color. Much of Sanders’ appeal is that he’s a plain-spoken guy with disheveled hair and big ideas who reminds many of us of a kindly grandfather sitting America down to set us straight. And he really is. Sanders lives with his wife, Jane, in Vermont, and he has four kids and seven grandkids. He’s squeaky clean, completely unpretentious and has spent a life devoted to public service. The perfect disguise for a guy with revolutionary socialist ideas, don’tcha think?